By Act of Congress on March 1, 1872, Yellowstone National Park was "dedicated and set apart as a public park or pleasuring ground for the benefit and enjoyment of the people" and "for the preservation, from injury or spoilation, of all timber, mineral deposits, natural curiosities, or wonders. and their retention in their natural condition." Yellowstone is the first and oldest national park in the world. The commanding features that initially attracted interest, and led to the preservation of Yellowstone as a national park, were geological -- the geothermal phenomena (there are more geysers and hot springs here than in the rest of the world combined), the colorful Grand Canyon of the Yellowstone River, fossil forests, and the size and elevation of Yellowstone Lake. The human history of the park is evidenced by cultural sites dating back 12,000 years. More recent history can be seen in the historic structures and sites that represent the various periods of park administration and visitor facilities development. The boundaries of Yellowstone National Park stretch into three states. Ninety-one percent of the park's 3,472 square miles are in Wyoming, 7.6 percent in Montana, and 1.4 percent in Idaho. There are five entrances -- the North, West, South, East, and Northeast. North Entrance: Near the gateway community of Gardiner, Montana, the North Entrance is the only park entrance open to wheeled vehicles all year. November through April, the North Entrance provides the only access to Cooke City, Montana. Beyond Cooke City the road is closed to wheeled vehicles November through April. The road from Mammoth to Norris is open to wheeled vehicles from the third Friday in April through the first Sunday in November, and to tracked oversnow vehicles from the third Wednesday in December to Monday of the first full week in March. Services are available year around. West Entrance: Adjacent to the town of West Yellowstone, Montana, the West Entrance is open to wheeled vehicles from the third Friday in April through the first Sunday in November, and to tracked oversnow vehicles from the third Wednesday in December to Monday of the second full week in March. Services are available year around. South and East Entrances: Open to wheeled vehicles from the first Friday of May through the first Sunday in November, and to tracked oversnow vehicles from the third Wednesday in December to Monday of the second full week in March. Limited services are available near the South and East Entrances. See our Road Construction Page for information about possible delays. Northeast Entrance: Near the gateway community of Cooke City, Montana, this entrance is open year around for wheeled vehicle access to Cooke City through Gardiner, Montana, and the North Entrance. Opening dates for roads east of Cooke City vary from year to year, depending on the weather. The Beartooth Highway is open from Friday of Memorial Weekend to 8:00 a.m. on the day following Columbus Day. Storms occasionally temporarily close the Beartooth Highway during this "open" period. Services are available year around. Commercial airlines serve the following airports near Yellowstone National Park all year: Cody and Jackson, Wyoming; Bozeman and Billings, Montana, and Idaho Falls, Idaho. The West Yellowstone, Montana airport is serviced from June to early September. Bus service from Bozeman, Montana, to West Yellowstone, Montana, via Highway 191 is available all year. Bus service directly from Idaho to West Yellowstone is limited to the summer months. Commercial transportation from Bozeman, Montana to Gardiner, Montana is available during the winter and summer seasons. Commercial transportation to the park from Cody and Jackson, Wyoming is available during the summer season. Contact local Chambers of Commerce for specific carriers and schedules. Train service is not available to Yellowstone National Park. The nearest train depots are in southeast Idaho and northern Montana. Contact Amtrak for specific schedules. 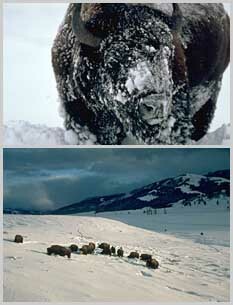 For more information about travelling to Yellowstone, check out the National Park Service's official Yellowstone web site at http://www.nps.gov/yell/planvisit/index.htm.